The recent leak of the ROM from the HTC Mondrian has inspired xda-members and news writers ElCondor and Livven to create some design concepts for this very first Windows Phone 7 device by HTC. Many HTC Mondrians have been floating around lately. Because the Mondrian is my dream device, I decided to make a concept that comes as close as possible to HTC’s way of design. 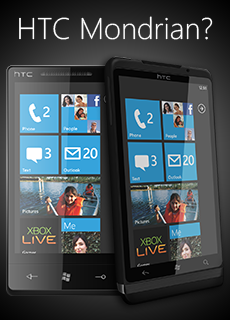 If you take a look at the phone, you’ll notice that the buttons come straight from HTC Android devices. First I wanted to create a small ‘chin’, just like the Desire, but it broke the design. The shiny brushed metal at the bottom of the devices is inspired by the same metal used in the HTC Wildfire. The Wildfire is the newest design from HTC, so I think it’s pretty logical that they will keep the design like this. Although the concept looks pretty big, it’s smaller than the HD2, with WVGA resolution and an 1,3Ghz Snapdragon processor. Continue on to the appropriate forum thread to view ElCondor’s concept thread and Livven’s concept thread.